Now that the last year is done and gone the analysis can begin. 2012 has turned out to be a record breaking year for Bollywood, for the first time in history a record 9 films crossed the Rs. 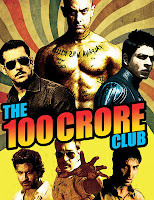 100 crores mark in nett collection. In 2011, 5 films had joined the Rs. 100 crores club and prior to that 2010 saw two films and 2009 and 2008 had 1 film each which started this exclusive club. Salman Khan leads the way with 5 films in the top 7 of the 100 Crores club and Ajay Devgn is close behind with 4 films on this list. Asin, Sonakshi Sinha and Kareena Kapoor lead the way for women with 4 films each in this exclusive club. In total there are 18 films that have crossed the Rs. 100 crores mark and it looks like any list with the top 20 highest grossing Bollywood films will now most likely only feature films from 2008 onwards. It's hard to believe but 2012 actually started of on a sour note with Players one of the biggest flops in Bollywood history. It wasn't until the final weekend of January when Agneepath was released and went on to be the first 100 crores earner of the year after that there was no turning back. March had trade analysts worried when Saif Ali Khan's Big budget Agent Vinod couldn't keep its head above water and was declared a disaster. April saw Housefull 2 reach 100 crores even though there was strong opposition from IPL5 in April and May. What was even more shocking was the fact that Son of Sardaar and Jab Tak Hai Jaan were released in the same Diwali Weekend and both went on to cross 100 crores. In fact, from June onwards almost every month, except for October, had a 100 crores blockbuster (but 2 films in November made up for the October loss, methinks). June, July, August and September saw the release of Rowdy Rathore, Bol Bachchan, Ek Tha Tiger and Barfi, respectively - all of which went all to cross 100 crores, in fact, Ek Tha Tiger came close to the 200 crores mark ending its theatrical run at Rs. 199.30 crores. As mentioned above October was lul and November saw 2 films which were joined by Dabangg 2 in December to round out the year with 9 new film added to the 100 crores club. What this means is that people are returning to the theaters, the demand for big screen entertainment is growing at a record pace, Now if Bollywood can just keep the content fresh and the budgets down films might just be able to recover cost from the theatrical run itself. If budgets are kept around 30-40 crores for most big budget blockbusters, not only will the investors be happy but the distributors can also make a profit.